The yearly Fuckparade was taking place again in Berlin on August 22 (2009). The gathering point was Revaler Strasse, where the 17 trucks were warming up for the parade. A part of this warm up were also the obligatory speeches. For this, the Fuckparade organisers invited Hans Cousto and Dr. Motte, whose talks can be seen here. They deserve some attention, especially what Motte had to say. After introducing himself he says: “I want to briefly sum up how I would like to define our electronic life culture. In a Nazi book about symbols I have read something great! You have to imagine – it was about runes!” He then not only describes the man rune, he also puts down the microphone and impersonates it stretching out his hands and then says “it means something very beautiful, unfortunately” the peace movement turned it upside down and made it into something “greedy”, because the original man rune means something like creative development in freedom, according to Dr. Motte (or his “Nazi book”), and “this is the expression of our electronic music, and our politicians should please preserve our freedom and not sell it to property funds who don’t care because this is our country, our country! !” After shouting the last words, and some applause by the Fuckparade audience, he continues: “It doesn’t belong to them but to us all, and I demand from all politicians also our mayor with his bad, gay politics that no one needs, to champion our ideals, our free spaces (…) for our free culture, not the culture of the empire from above”. But even worse – and not picked up by the mainstream press – is that he explicitly bases his definition of “our electronic life culture” on Nazi esotericism – and this was not challenged at the Fuckparade itself. There has been many different kinds of research into the history and meaning of runes. This is not the place to go into it, but it is worth noting that the rune “research” of the Nazis is largely based on Guido von List, a charlatan who claimed to have received his rune wisdom in visions, and author of “Das Geheimnis der Runen” (Secrets of the Runes) from 1908. I am no expert in the field but it appears that List’s Runology is practically completely made up to fit his völkisch-nationalist ideology. Via other far right esotericists such as Jörg Lanz von Liebenfels and Karl Maria Wiligut this became the basis for the Nazi interpretation of runes. Although we don’t know which book exactly Dr. Motte is referring to, we have to assume (since it’s a “Nazi book”) that it reflects the völkisch-racist and anti-semitic ideology of the mentioned authors. At least the Fuckparade realized they had to distance themselves clearly from Dr. Motte and did so on their web site on Sept. 1. 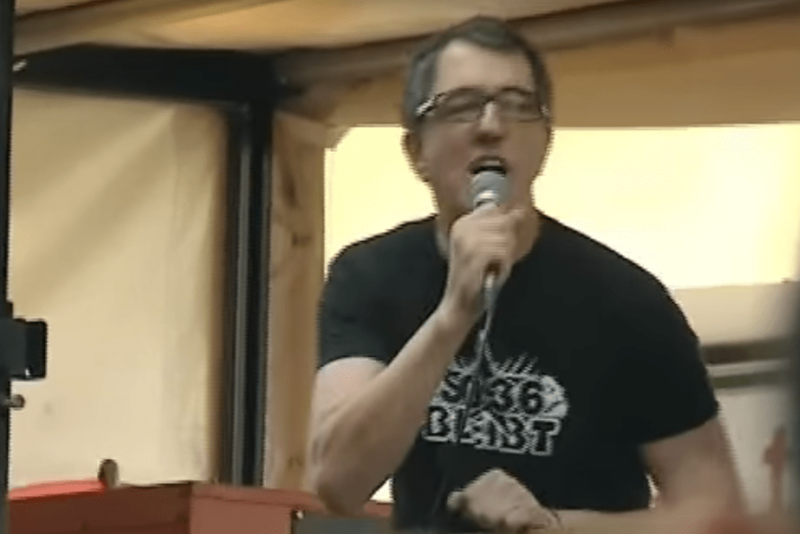 Matthias Roeingh took some inspiration from a “Nazi Book” insofar as to speak in a public forum about it……… where was the Antifa boot to the head for him? Dachte erst da werden wohl wieder ein paar harmlose Aussagen jemandem im Mund umgedreht (wie es bei “sehr linkslastigen” – sorry Christoph) Publikationen oft der Fall ist. Habe mir dann die Rede mal angeschaut und da hat man effektiv den Eindruck, ein Nazi-Aufpeitscher habe sich durch ein Zeittor von 1937 direkt auf die Fuckparade gebeamt.